Ten days ago I had back surgery which has slowed me down a bit–since I can only sit for twenty minutes; otherwise I must be walking or lying down and I must wear this really cute brace that suggests I will break out into yodeling any minute. This was a piece I did for FastFridayFiber Challenge; not my best effort as I was a bit distracted. It is the cover for one of my sketch books, a habit I’ve acquired over the past few years. 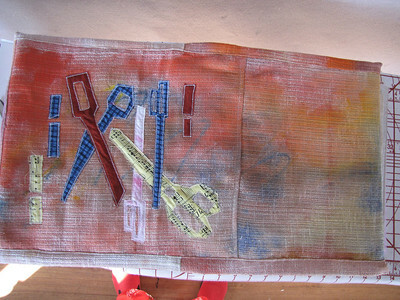 The sketchbook gets covered midway through use or at the end. I also cover my journals with some sort of artwork. This particular challenge was to abstract something in the kitchen or sewing room. I chose my scissors. I didn’t realize how many small pieces there would be and simplified the images. Wishing you a speedy recovery, Sylvia! Glad to see you’re still making art.